Thanks to a little post about Gamification in eCommerce I did a while back, Aheadworks got in touch and asked me to have a look at their newest Magento extension – the eCommerce Gamification Suite. After having played around with it for a little while on a local Magento installation, I think I’ve learned enough to give it a fair review. The mark of a good extension is one that doesn’t drop a nuclear warhead on your website after you install it. Aheadworks are normally quite good at performing this trick, and this extension does not disappoint. Their 2 stage installation process has always been easy enough to follow – simply upload one set of files to the server, then the other. As with all extensions a good cache refresh and a logout/back in again is in order and then we’re up and running – so far so good! This installed no-problem on a box-fresh Magento CE 1.7.0.2 running locally on MAMP. Now that the extension is installed it’s time to pull on those marigolds and get to work. 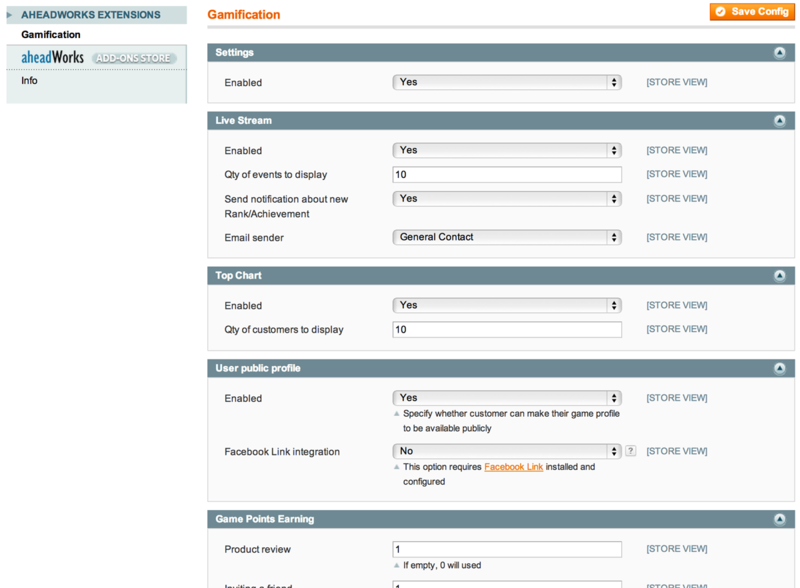 One pet-hate of mine is over-complicated configuration options for extensions. Sometimes you’ll find an extension with just a simple on/off button – great! Other times you’ll be poking around for hours until every select box, checkbox and radio button has been pushed, clicked and poked, and after all of that it still doesn’t work! 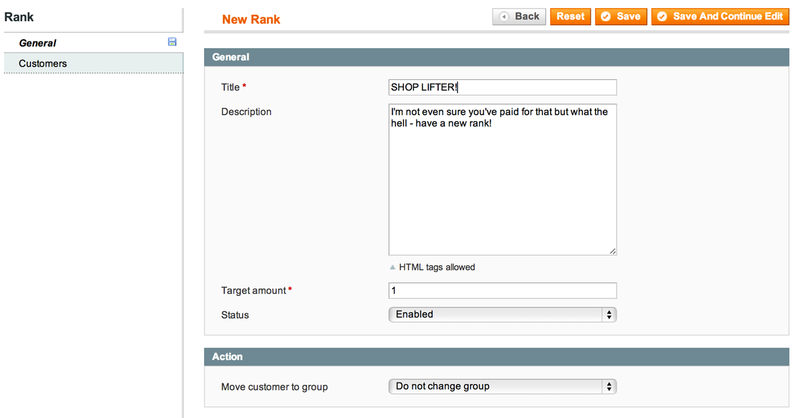 Thankfully the eCommerce Gamification Suite extension is much closer to the former. The first thing I did was pop-along to System > Configuration (a regular meeting place for new extensions) and see what’s new. Other than a slightly annoying (and somewhat distracting – though nicely set out) Aheadworks Add-Ons Store menu option which I’ll probably try and hack-out at some point, it was rather easy to find my on/off button along with a couple of well-intentioned sidebar display options. A couple of clicks later and I’ve got my placeholders all set up on my store ready and waiting to be populated with data. 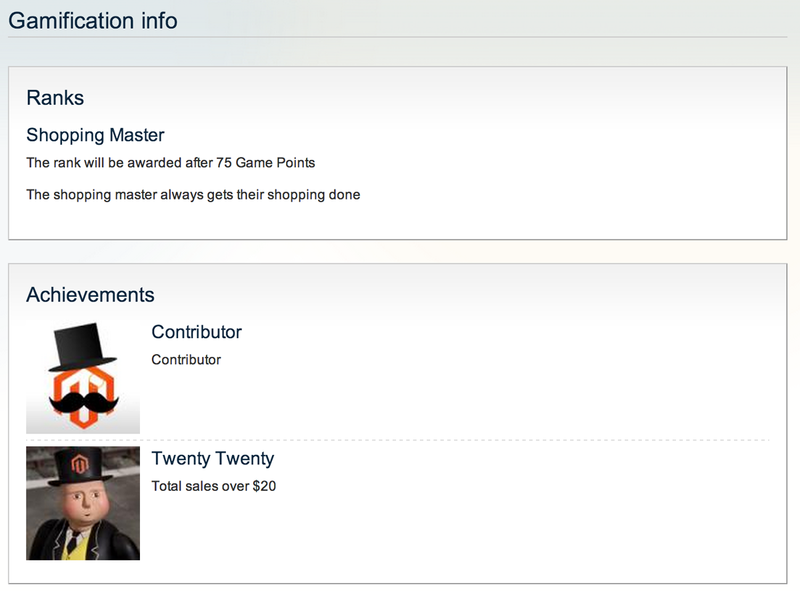 One of the main features of the eCommerce Gamification Suite is the ability to set up ranks and achievements. Anyone who’s familiar with the XBox 360 achievements system, or the PS3 trophy system will feel right at home here. Ranks allow you to “Rank-up” (think Call of Duty) based on a certain criteria, in this case – POINTS! You can add as many of these ranks as you like – it all really depends on how far you want to push it and this extension does a good job of keeping things simple. Add a title (e.g. “Super Shopper”) and a little description (e.g. “The super shopper always get’s their shopping done…”) and then the number of points to qualify (e.g. 75) and you’re laughing. Ranks are so easy to setup – it’s criminal! I especially like the fact that on this page (Promotions > Gamification > Ranks > Manage Ranks) you can choose to promote a customer into a new customer group. Doing so opens the door to a whole host of possibilities – things such as customer group pricing, group-specific coupons etc etc. Such a simple tweak has extended the usability of this extension immeasurably! Lastly the ability to see all customers who have achieved this rank, and also the small reporting feature that shows all ranking changes make it really simple to manage and re-enforce the fact that it’s a well put together concept. Achievements work in a similar way in terms of their simplicity – you can add your own icon for the badge, as well as the title and description. I’m glad Aheadworks did away with the complicated rules system used in some extensions (borrowed from the default Magento promotions section) and has instead opted for it’s own simple set of rules – based on quantity or amount. Hooking into reviews and referrals also boosts the share value of your website. As this extension is all about Gamification – it really needs to grab the customer’s attention. It needs to make the customer want to “rank-up” and to earn achievements. Sadly, out of the box I don’t believe this is the case, as the styling and placement of all the Gamification factors is all very…well…default-looking. Then again, whose job is it to make a website more appealing? Should we (as web designers) expect to have to style every little bit? To be honest, yes I do, but it’s still put a dampener on proceedings – you can’t just plug and play with this extension unless you do some serious design work – it just won’t have the impact. You get a few areas that you can customise with this extension, mainly the side-bar elements, public profile page and info page, all of which could do with a serious lick of paint. Most of the links take you through to the Gamification/Info page that will give your customers an overview of all the ranks and achievements that can be obtained. 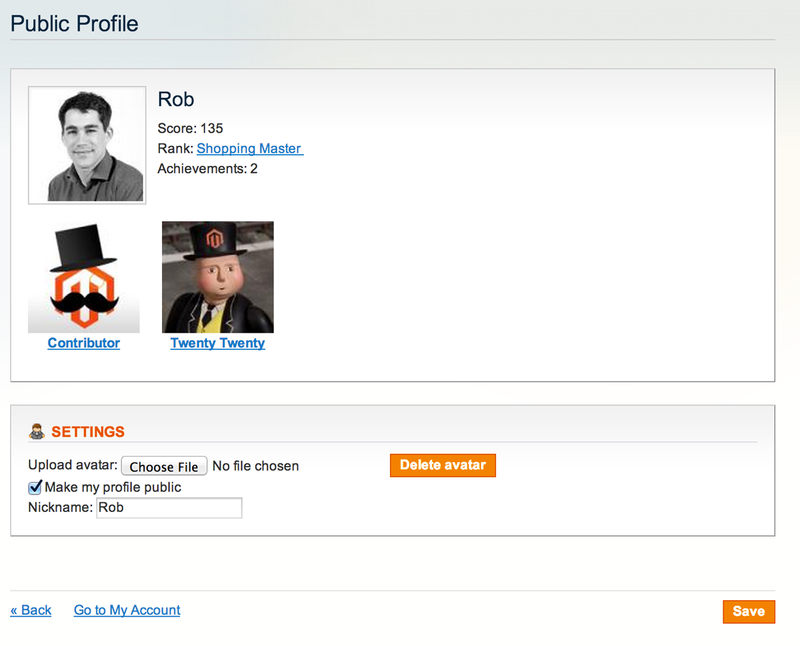 The Public profile page simply displays an avatar image (selectable by each customer) and then their total points tally, rank, achievements and recent activity. If only there was an achievement for blandest avatar. All-in-all, pretty simple stuff – but CSS’d correctly I believe it’s possible to make something really quite decent here. It’s quite hard to say a big yes or a big no to a Gamification extension – as it’s all about the context its integrated into, but with the eCommerce Gamification Suite by Aheadworks I believe they’ve given us the fundamentals for something that could benefit a lot of websites (if done correctly!). The configuration is quick and simple, the elements that the extension controls on the website are well thought-out and easily customisable (most of the text can be translated inline). The points system is OK and works well with ranks and achievements. The functionality is sound; points and achievements are only awarded after a successful order conversion (I was using check/money order locally and points were only given out after I invoiced the order). If I were to make a Magento-Powered website in the type of industry where the target market appreciates a bit of competitive purchasing, then I would definitely buy this extension. If I were developing a website that simply sold shoes for example I probably wouldn’t – but that’s nothing against the extension – just the nature of the market. As an extension I’m giving it a 4/5 or to be more precise a strong 82.7%.